By teaching mathematics through an inquiry approach to learning, students will be involved in hands on engaging experiences applying critical thinking and problem solving skills. The Alaska Native Knowledge Network has a diagram on their website (see above) representing the ‘iceberg’ model of thinking about Aboriginal culture. 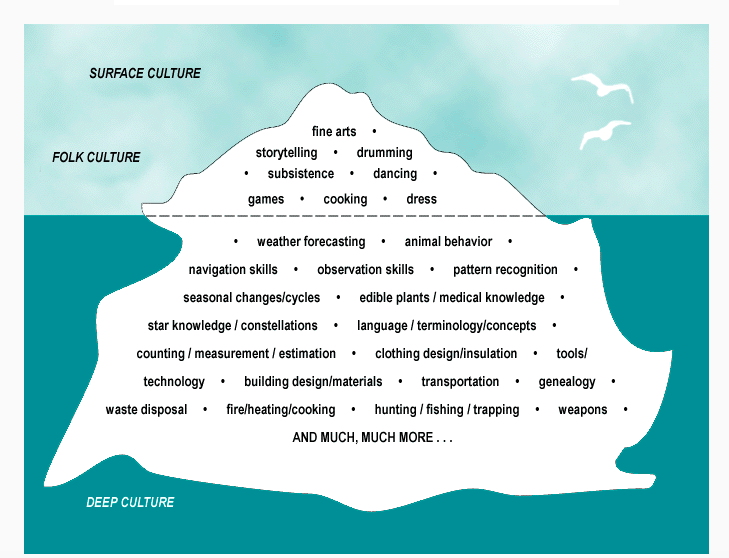 This is an effective visual when developing culturally responsive math curriculum with reminders about a variety of ways of making connections to deep culture as opposed to only what’s above the surface level. 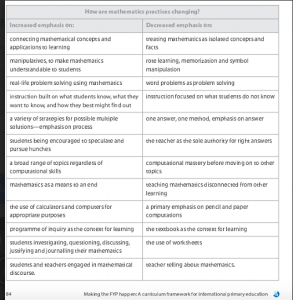 This ties in well with also considering the math concepts being taught and ensuring that math concepts are taught in more depth for greater understanding than at a surface level. By engaging students in authentic, relevant learning engagements, students’ conceptual understandings should also be enhanced. These were the findings in the research done with Canadian Aboriginal youth (Nicol, Archibald & Baker. Designing a model of culturally responsive mathematics education: place,relationships and storywork). 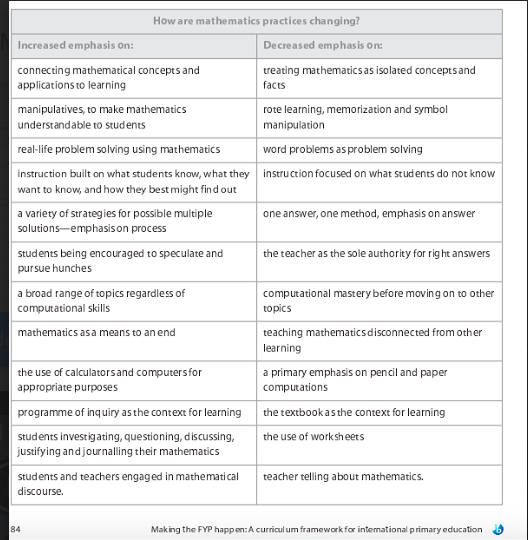 Below, I have included a diagram from the International Baccalaureate (http://www.ibo.org/) showing how Math practices are changing in mainstream classrooms. The curriculum is based on ‘best practices’ such as starting with students’ prior knowledge, making connections between different subject areas and learning through authentic experiences. The article and link to curriculum below show some wonderful ways of integrating Aboriginal culture into our teaching practices. McGregor, H. E. (2012). Curriculum change in Nunavut: towards Inuit Qaujimajatuqangit.McGill Journal of Education, 47(3), 285-302. Nicol, C., Archibald, J., Baker, J. (2013), Designing a Model of Culturally Responsive Mathematics Education: Place, Relationships and Storywork. Mathematics Education Research Journal. 25(1), 73-89.